Spencer (Dwayne Johnson) takes his fight to the next level. Ricky (John David Washington) jeopardizes his comeback. Written by Stephen Levinson & Rob Weiss; directed by Simon Cellan Jones. Spencer (Dwayne Johnson) and Joe (Rob Corddry) find themselves in a crisis at SportsX. Ricky (John David Washington) considers his motivations in ending his retirement. Jason (Troy Garity) turns to Donna (Amanda Rea) for help. Written by Rob Weiss & Stephen Levinson; directed by Rob Weiss. Spencer (Dwayne Johnson) looks to elevate the SportsX TV brand, while Joe (Rob Corddry) weighs a new offer. At Jayda’s (Joy Bryant) insistence, Spencer meets Quincy (Eli Goree). Ricky (John David Washington) tries to prove to Kisan (Kris D. Lofton) he’s still got the goods, while Charles (Omar Benson Miller) is encouraged by Julie (Jazmyn Simon) to bring more flair to his job. Written by Chloe Domont & Zach Robbins; directed by Rob Weiss. Spencer (Dwayne Johnson) recruits Q (Eli Goree) to help him leverage a deal. With Reggie (London Brown) in tow, Joe (Rob Corddry) talks business with a group of extreme skateboarders known collectively as Illegal Civilization. Charles (Omar Benson Miller) hosts a pre-free-agent reception. Written by Rashard Mendenhall; directed by Simon Cellan Jones. Spencer (Dwayne Johnson) calls on the Anderson Brothers (Richard Schiff, Steven Weber) for help. Joe (Rob Corddry) pitches Illegal Civilization to a major shoe brand. Ricky (John David Washington) loses his cool at a neighbor’s pool party. Julie (Jazmyn Simon) accuses an overworked Charles (Omar Benson Miller) of being afraid to succeed. Written by Jason Lew; directed by Chloe Domont. Spencer (Dwayne Johnson) takes a big risk, with the potential to blow the deal. After a heart-to-heart with Ricky (John David Washington), Charles (Omar Benson Miller) spells out his vision for the team. Joe (Rob Corddry) and Reggie (London Brown) enlist Vernon (Donovan W. Carter) and Terrell “Sizzle” Suggs (himself) to persuade Illegal Civilization. The series is also available on HBO NOW, HBO GO, HBO On Demand and partners’ streaming portals. After refusing to compromise his principles by joining an alliance with the filthy-rich Anderson brothers to move a football franchise to Las Vegas, Spencer and his partner Joe set out to expand their foothold in the client-management business, weighing an opportunity to purchase an extreme-sports LA outfit. Meanwhile, Ricky eyes a comeback while chafing at his new life as a father; Charles faces the challenges of being a general manager; Vernon continues his profligate ways, to the chagrin of his sidekick, Reggie; and Jason tries to set Spencer up with a high-school prodigy, Quincy Crawford, and his equally impressive mother, Jayda. Exploring the glamorous, often cutthroat, world of pro football through a group of past and present players striving to stay in the game, BALLERS stars Dwayne Johnson as ex-superstar Spencer Strasmore, who has reinvented himself as a financial manager for today’s players. Created by Stephen Levinson (HBO’s “Boardwalk Empire”), the hit comedy series returns for its nine-episode fourth season SUNDAY, AUG. 12 (10:00-10:30 p.m. ET/PT), exclusively on HBO. Other returning cast regulars include John David Washington, Rob Corddry, Omar Benson Miller, Donovan Carter, Troy Garity, London Brown and Brittany S. Hall. Returning guest stars include Carl McDowell, Jazmyn Simon, Robert Wisdom, Richard Schiff and Steven Weber. Spencer (Dwayne Johnson) and Joe (Rob Corddry) weigh the pros and cons of acquiring an extreme-sport agency. Ricky (John David Washington) sets down roots in LA with Amber (Brittany S. Hall) and their daughter, but finds himself yearning for something else. Charles (Omar Benson Miller) rallies a group of disgruntled employees as he begins his new tenure with the Rams. Written by Stephen Levinson & Rob Weiss; directed by Julian Farino. Spencer (Dwayne Johnson) becomes immersed in a marketing controversy. Still smarting from their feud in Miami, Charles (Omar Benson Miller) agrees to give Ricky (John David Washington) a chance, against his better instincts. Spencer (Dwayne Johnson) looks to reign in Lance’s (Russell Brand) excesses. Vernon (Donovan W. Carter) gets carried away at a ceremony retiring his number at his old LA high school, to Reggie’s (London Brown) dismay. 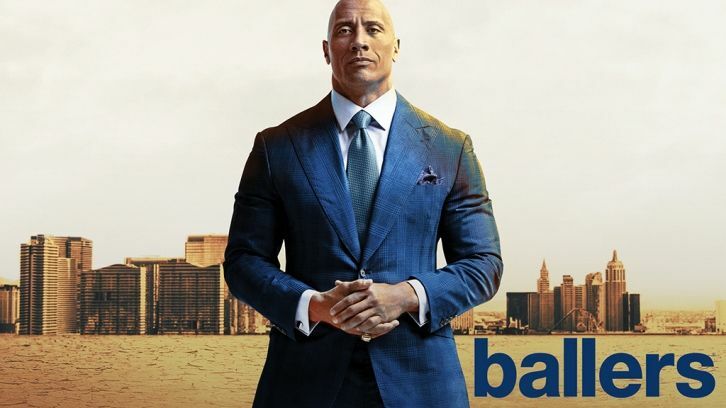 BALLERS was created by Stephen Levinson; executive produced by Stephen Levinson, Mark Wahlberg, Dwayne Johnson, Dany Garcia, Peter Berg, Rob Weiss, Denis Biggs, Karyn McCarthy and Julian Farino; producers, Janace Tashjian, Dave Levinson, Julie Camino, Rashard Mendenhall and Joey Krutel; co-producers, Olivier Arnesen and Spencer Strasmore; executive story editor, Jason Lew.